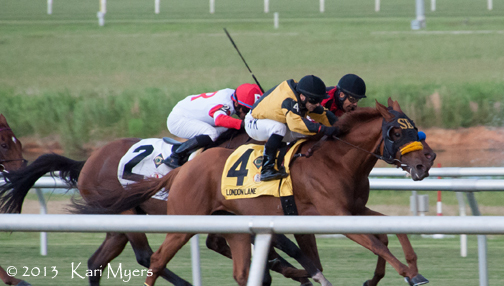 June 22, 2013: 50-1 shot London Lane (#4) passes the field to win the Colonial Turf Cup at Colonial Downs. Colonial Downs is a small but nicely built track in New Kent, VA. It’s the closest track to where I live, so I try to make it for their “big” racing days each summer. One of those days is in June, when they run the $300,000 Grade 2 Colonial Turf Cup and the $100,000 Grade 3 All Along Stakes. This year the day started out rainy, but the clouds disappeared quickly and the rain stayed away after an initial downpour. There was live music, a bunch of food trucks, and good company to be had! The Colonial Turf Cup field included Air Support, who was second in the race last year and who runs for the same connections as Kentucky Derby winner Orb. 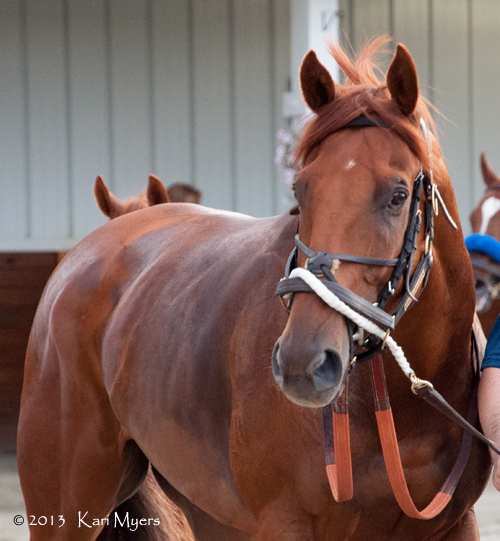 Atigun, 3rd in the 2012 Belmont Stakes, made the trip for Kenny McPeek who was in town to saddle him. The field was rounded out by longshot London Lane, General Logan for Graham Motion, the Ramsey’s Hyper, and stakes winners Roadhog, Swift Warrior, and Two Notch Road. A friend of mine decided to place a $5 win bet on London Lane because she had visited London on vacation. I mean, why not? So you can imagine how loudly we were screaming at the top of the stretch as London Lane passed them all and won by almost a length. He went off at odds of 50-1, so that $5 win bet paid her $251 in return. Not bad for a hunch play! London Lane is a 6-year-old gelding by Langfuhr out of the Miswaki mare Travelling. One of the things that makes this win special is that he was bred by his owners, so they’ve had him his entire life. It’s nice to see that sort of a win. Horacio Karamanos rode him to victory, and he has since become the winningest jockey to ride at Colonial Downs. Love it! 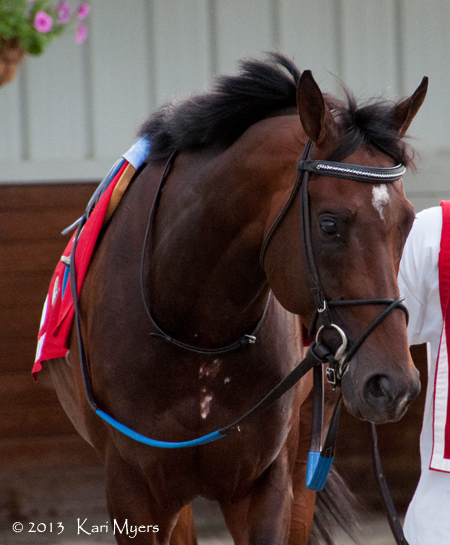 June 22, 2013: London Lane heads out of the paddock at Colonial Downs. 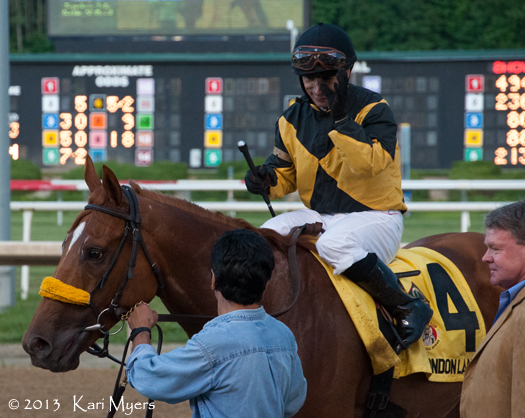 June 22, 2013: London Lane and jockey Horacio Karamanos head into the winner’s circle with their happy connections after his win in the Grade 2 Colonial Turf Cup. 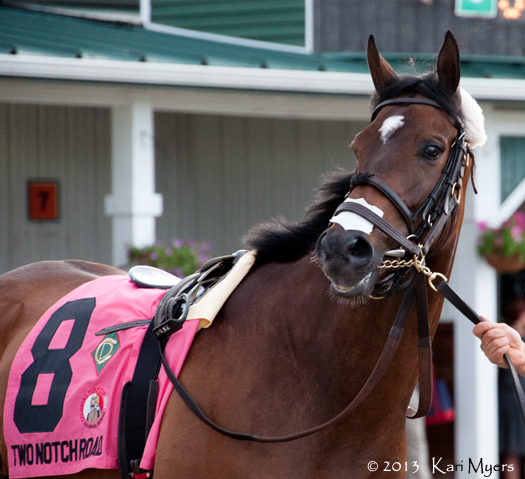 June 22, 2013: Air Support bounces into a paddock he knows well at Colonial Downs. 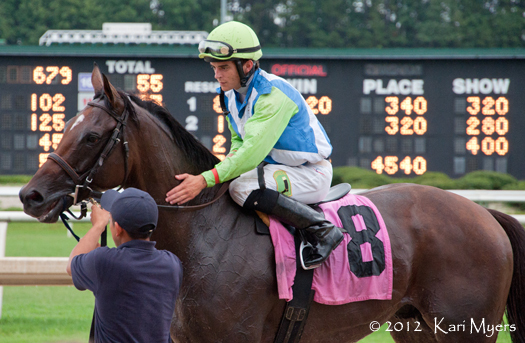 He was 2nd in the 2012 Colonial Turf Cup and won the 2011 Virginia Derby here. June 22, 2013: This handsome gelding is Roadhog, a multiple stakes winner by the sire Bowman’s Band. June 22, 2013: This adorable guy is Two Notch Road. He spent most of the time gawking at the crowd and stopping to stare at everything going on. Even on the way to get unsaddled after the race, his head was up in the air staring at all the people. He ran last, but he was the most entertaining! He had almost 3 years off from racing between 2010 and 2013, but he was actually 3rd in the Colonial Turf Cup in 2010 and 4th in the 2010 Virginia Derby, both behind Paddy O’Prado . June 22, 2013: Atigun went off as the betting favorite, but ended up finishing 7th of 8. And those white spots on his chest aren’t lather, they’re just… spots! 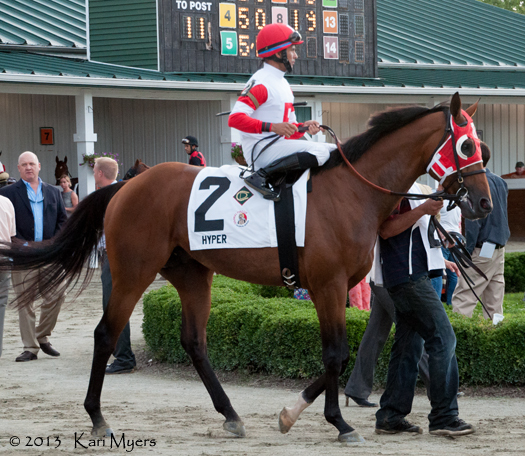 June 22, 2013: Hyper ran a solid 2nd, which shoudln’t be any surprise. The Ramseys have been on fire lately! Hyper is a son of Victory Gallop, and a homebred for the Ramseys. 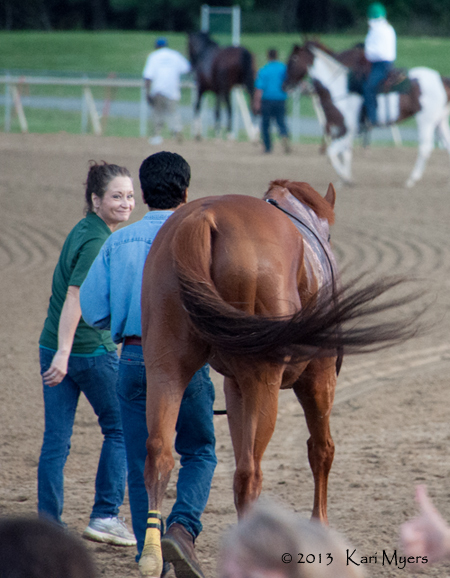 June 22, 2013: London Lane and his happy people head back to the barn after the race. In July 2012, I drove up to Colonial Downs in New Kent, Virginia to watch the Virginia Derby. It’s such a beautiful track and is probably best known for its Secretariat Turf Course, which is named for the most famous Virginia-bred in history. (Trivia for the day: their turf course is 180 feet wide, making it the widest in the US.) On the Virginia Derby undercard, the Kitten’s Joy Stakes had two runners that I really wanted to see—Lentenor and Action Andy—and they didn’t disappoint! Lentenor beat Andy by a head to win his first stakes race. If you’re not familiar with Lentenor, he is a horse by the late Dynaformer out of the mare La Ville Rouge. This makes him a full brother to 2006 Kentucky Derby winner Barbaro, and the two look very much alike. La Ville Rouge has foaled five colts in all by Dynaformer, including Nicanor, Margano, and Pennmarydel. It’s a family that many fans keep close tabs on, but none so far has repeated the brilliance of Barbaro. 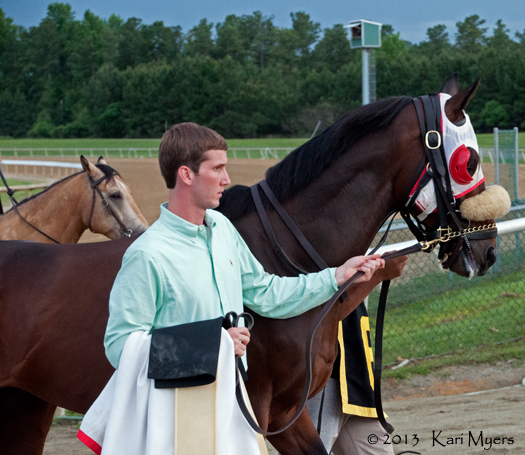 July 21, 2012: Lentenor heading into the paddock at Colonial Downs. 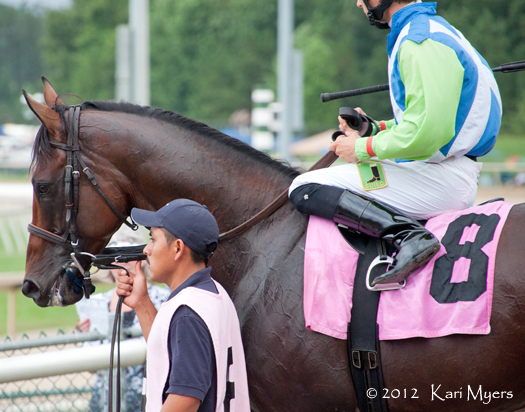 Lentenor was retired after his next race, a 4th in the Grade 3 Cliff Hanger Stakes in September 2012. He ran a total of 17 times from 2009 to 2012, with 4 wins and earnings of almost $185,000. One of his better races was the Grade 1 Florida Derby in 2010, where he ran 4th to Ice Box, a colt trained by Nick Zito who went on to finish 2nd in that year’s Kentucky Derby. Finishing behind Lentenor in the Florida Derby were multiple graded stakes winners First Dude and Game On Dude! It was recently announced that Lentenor will stand the 2013 breeding season at historic Calumet Farm in Lexington, KY for a fee of $7,500. Calumet is building up their stallion roster and will also stand Dynaformer’s Melbourne Cup winner, Americain. Eye of the Leopard, Aikenite, and champion Point Given will also be located there this season. 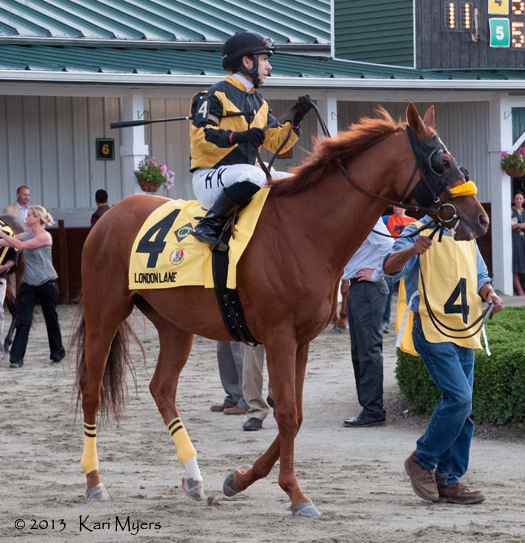 July 21, 2012: Lentenor heads out onto the track for the Kitten’s Joy Stakes at Colonial Downs. It’s a little eerie to see him in the Lael Stables silks wearing the #8 cloth, which is the number his full brother Barbaro wore in his Kentucky Derby win. 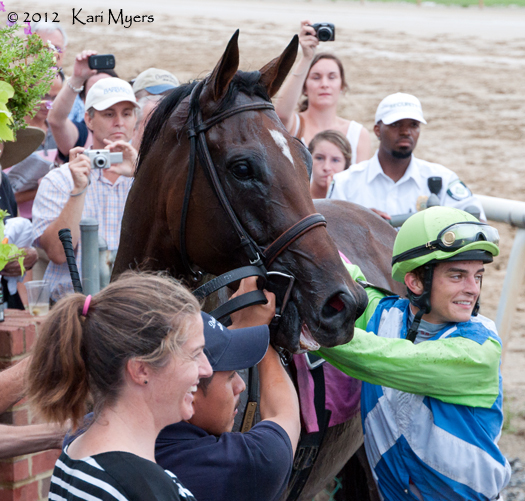 July 21, 2012: Jockey Sheldon Russell gives Lentenor a pat as they walk into the winner’s circle after the Kitten’s Joy Stakes. 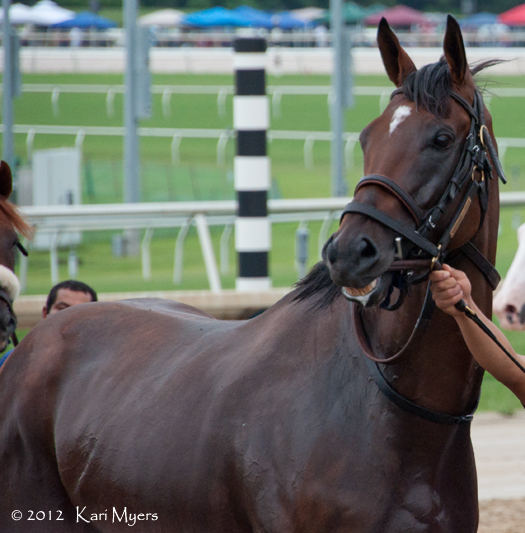 July 21, 2012: Everyone is all smiles in the winner’s circle, including Lentenor!